An expanded edition of EFFector, EFF's almost-weekly newsletter. I’m Danny O’Brien, EFF’s new International Director. Five years ago, I worked on the EFF team that identified the threat of ACTA, a secret global intellectual property treaty we discovered was being used to smuggle Internet control provisions into the laws of over thirty countries. Together with an amazing worldwide coalition of activists from Europe to South Korea, we beat back that threat. I’m writing to you today to explain what's happening with the new ACTA: the Trans-Pacific Partnership (TPP). TPP has been around since the Bush administration, but recently the pace has picked up, with governments saying they want to get the agreement signed and done by the end of this year. 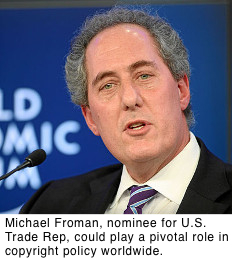 This is Michael Froman, and barring a scandal, he's about to be the new United States Trade Representative (USTR). The U.S. Trade Representative negotiates international trade agreements on behalf of the United States. Congress has one opportunity to ask him questions at his nomination hearing. They should take full advantage of it. Right now, the only reason the public knows anything about what the USTR is doing on IP is that whistleblowers participating in the treaty process have leaked what they can. (Congressman Darrell Issa re-published the leaks on his own office site, over the USTR's objections). The proposed rules could prevent individuals from circumventing DRM—the technical barriers put in place to make copying, accessing, and sharing copyrighted content more difficult. This would hinder technical fixes necessary to make content accessible for the blind or to unlock your phone. It contains provisions that would, by default, regulate "temporary" reproductions of copyrighted files, thereby restricting all kinds of intrinsic functions of your computer. It increases copyright terms well beyond international standards, adding some 20 years to copyright terms worldwide, potentially robbing the public domain of decades of cultural works. In many countries, an allegation of infringement is not enough to get material taken offline. TPP’s proposals, by contrast, put in place a system (similar to the one we have in the U.S.) that encourages ISPs to take down content based on nothing but a notice. We’ve seen how that can be abused here—do we really want to export it wholesale? Treaties like this also help to fossilize existing U.S. law and force other countries to sign up for American missteps. Momentum in D.C. for rolling back copyright terms and DRM law is growing, but opponents of those changes have argued that lawmakers can't undo their own mistakes—because, they say, we've already signed onto IP trade agreements that we supposedly can't undo. We're asking U.S. senators to use the nomination process to grill Froman about the USTR’s IP plans, and we’re petitioning him directly to adopt meaningful transparency and stop using trade agreements to push aggressive IP programs worldwide. Could Froman really reform U.S. trade agreement strategies? Yes, but only if he and the Administration face coordinated pressure from American politicians and citizens plus resistance from other countries pushing back against American demands. 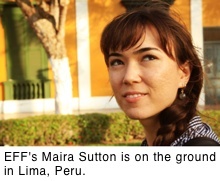 Which brings us to why EFF's Maira Sutton and Katitza Rodriguez are remotely working right now—from Lima, the capital of Peru. Starting today, the U.S. Trade Rep and negotiators from 10 other countries are meeting in Lima to take part in the latest round of negotiations for TPP. We beat them there. Kat is our International Rights Director. She's also Peruvian. She's spent the last month in Lima working with fellow Peruvian technologists, makers and artists, highlighting how TPP will affect them. She has been working with the other groups fighting TPP on the ground, including Hiperderecho, Peru's own digital rights activism group. The result? 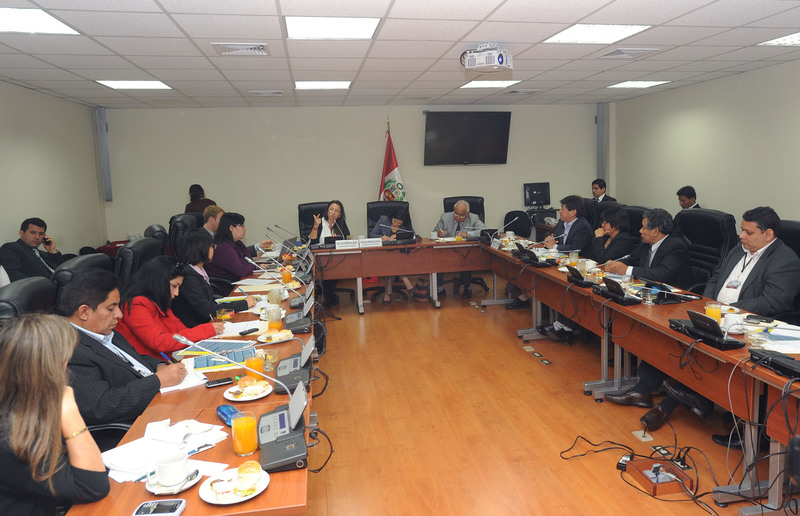 An explosion in information and public debate in Peru about TPP. 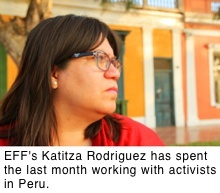 Kat has written Spanish language editorials, met with Peruvian politicians, journalists, students, free software advocates and filmmakers. Lima's hackerspace, Escuelab, hosted a two-day hackathon that produced memes and microsites that explain TPP to fellow Peruvians and the world. There's even the inevitable Peruvian TPP Downfall video. Other hackerspaces took part around the world, producing sites with titles like http://whytheheckshouldicareaboutthetpp.com/. The slogan and hashtag of Peruvians' digital rights activists is "#yaratpp", a slang term which means (roughly) "Warning! TPP!". Peruvians have joined the fight at Nonegociable.pe, asking their President to set clear non-negotiable lines to ensure that Peruvians' fundamental freedoms are respected in the TPP negotiations. The TPP negotiators are on deadline in Lima. They've already said TPP's IP chapter is one of the "more challenging issues that remain." It's more challenging still when the host country is demanding to know why this trade agreement would undermine local entrepreneurs and artists. Meanwhile, politicians back in the U.S. are demanding a closer look at their head negotiator's IP stance. Like battling ACTA, stopping the TPP and its descendants is going to be a long-term fight that will take a worldwide effort. But you can help us today by taking advantage of the Froman nomination to speak truth to power. Stay tuned to the Deeplinks blog for more updates on the fight for sensible global copyright policy.